At the end of July I fell asleep on my multi-tool half way through competing in a 24 hour mixed pairs race, (as you do!) and ended up with a stiff back. Four weeks later I found myself in tears in a doctor's surgery in France, After 2 painful, sleepless nights my French completely deserted me as I attempted to say to the doctor that I had a "broken back". I realised I must have confused the french for "back" and "heart" as I looked at the prescription the doctor had given me - anti depressants?! 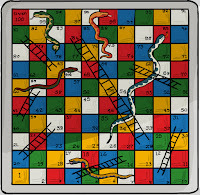 Training for a specific goal is like playing a game of snakes and ladders. 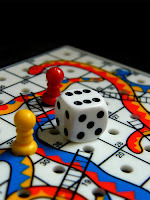 All the time you are training you are rolling the dice and progressing along the board. The more you train the more you roll the dice and the quicker you get to the goal. Every now and then you come across a square that is at the bottom of a ladder and you make a shortcut jump closer to the goal. We all know those things that have made a difference - finding a good coach, a better piece of kit or maybe a new nutritional strategy. I am now lying flat on my back staring at the ceiling. No bending, lifting or twisting and absolutely no strain on my back (or training) for 6 weeks. I have hit one of the biggest snakes on the board. I've landed on that snake that dumps you right back at the start. Not only that, whilst everybody else is training, I am not even allowed to roll the dice. I should stick to riding my bike! The pain and numbness that took me to the doctor's surgery in France had started off innocently as a stiff back. I am not sure exactly how it deteriorated from stiffness into pain into numbness, it was most probably a combination of events. The stiffness after the 24 hour race worsened on our family holiday. I'm not used to being still but tempted by the perfect sun lounger( sea view and ordering distance from the bar) I barely moved for 3 days. Although self indulgent, this didn't help my flexibility. I was then coerced into doing a beginner windsurfing lesson. The unplanned 'back flip dismount' although quite funny to see, didn't bend me in the way nature intended! I knew there was a problem, but because I'm stubborn I carried on training and riding despite all my physio knowledge telling me that the pain in my leg was not good news. Medical people really do make the worst patients! The final straw that bought on the numbness and the weak leg was nothing more onerous than putting on my shoe. 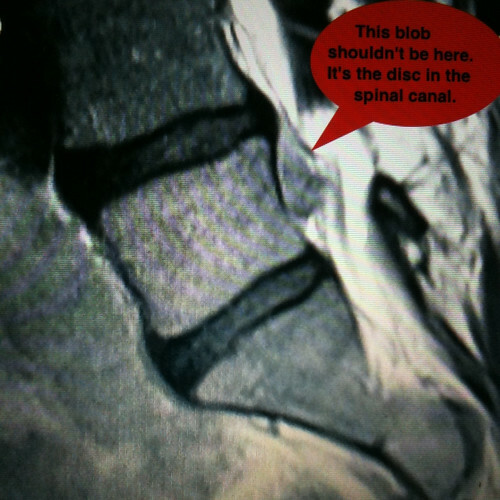 The scan showed a large sequestered disc. Two days later we were getting ready to go to another race - I was not riding, just supporting the AQR team. I realised as I was packing for the race that my legs felt really odd and the numbness was spreading to places you really don't want numbness. To my horror I realised I was getting cauda equina syndrome (a rare complication of spinal chord compression which is a medical emergency). Simon came back from a quick trip to the supermarket and realised I was looking shell shocked. "I think I have to go to A&E", I said. I had been trying to get through to my consultant, but it was a Bank Holiday weekend and he wasn't working. I knew my condition was really serious, but I also knew that there were very few people who I really trusted to do the operation. My consultant, Mr Fahy, is hugely experienced, specializing in 'sporty spines' so I was beyond relieved when he returned my call. He confirmed my suspicion with the words, "you are coming in for surgery right away, get to London and I will call you when I have found out which theatre I can open." An hour later I hobbled into a private hospital in London. My insurance company had told me I wasn't covered, but my consultant had given me absolute instructions that with any delay I risked irreversible nerve damage to my lower half - possible double incontinence and poor mobility for the rest of my life. It was a no brainer. I was met at the hospital by a suited doorman who offered to carry my bag. He then looked very uncomfortable, not quite knowing how to carry my muddy Camel back. Within an hour I was being wheeled down to surgery. The anesthetist had noticed Simon had arrived still wearing his team AQR race lycra and delayed putting me under to compare notes on trails and achievements. We even compared notes on the merits of steel hardtails and Cotic bikes - mountain bikers get everywhere! The surgery appears to have been a success - Yaaay! No cauda equina symptoms!! Having said that, the nerves to my legs took a bit of a bashing and leg recovery is going to take time. 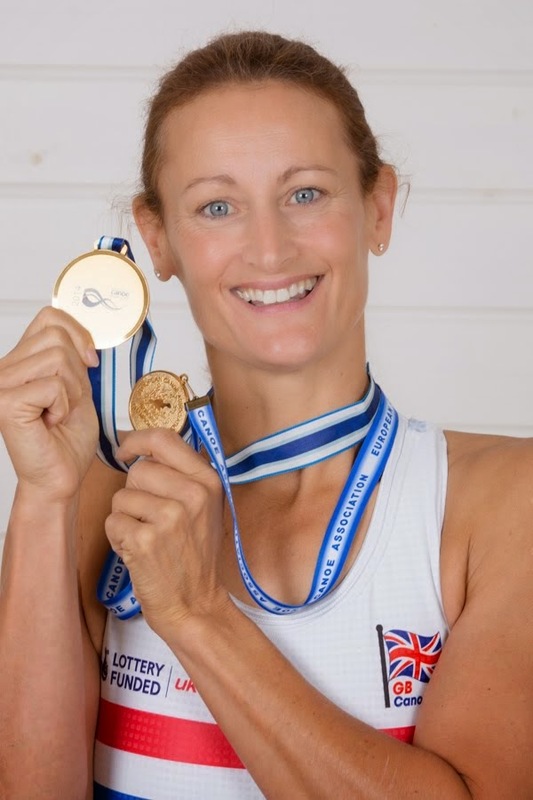 Two months ago I was rolling the dice, and working towards my legs competing at the World solo 24 hour Championships 2012. Then a month ago I was struggling even to walk. With practice and determination, my legs get a little stronger every day. I am now able to (slowly) walk 4 miles! At the moment the thought of riding my bike for 24 minutes, let alone 24 hours seems an impossible dream. As my legs improve and I look back, I realise that goals originally thought of as impossible were just temporarily unavailable. So that's how I see the future too. 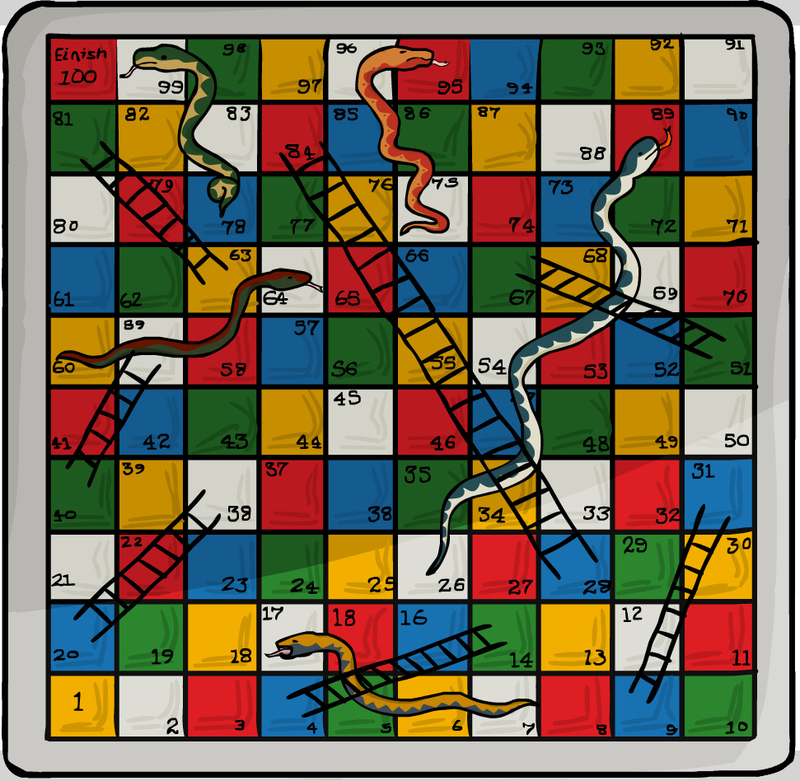 I know that it will take me a long time to work my way up the board of snakes and ladders, but if I don't throw the dice I simply wont get anywhere, so I'm going to carry on. I am perfectly happy to be throwing twos and threes rather than fives and sixes because I had a taste of what it would be like to have no dice at all. I realise that I will be nowhere near the peak I was working towards for at next year's World Solo 24hour Championships, there is no doubt - with the help of my coach - I will be there. One final word - A massive Thank you to Mr Fahy for generously giving up his Bank Holiday - if it wasn't for him I might not even be thinking about picking up that dice again. Thank you.